Michael Grandinetti is a talented, unique, and engaging magician who will have you at the edge of your set during his performances whether you’re packed into stadiums and arenas around the country, viewers of the second season of Master Of Illusion (and new series, Don’t Blink on POP TV) or in the comfort of your own home. 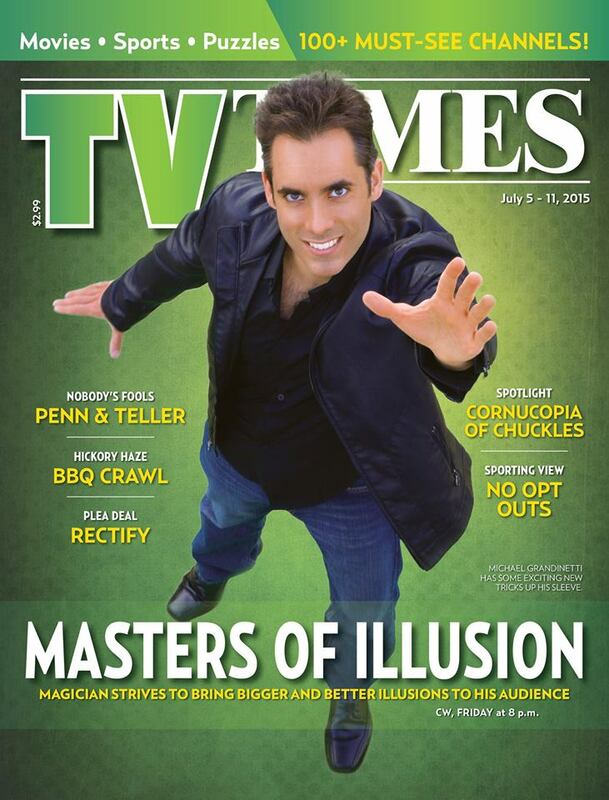 He will be on season two of, “Master of Illusion” that hits the CW on July 10th. Don’t Blink is all about street magic, airing on POP TV now, and is taking the magic off stage and in your face. Not only is Michael Grandinetti a master of illusion, he is also a master of the art of levitation. On July 8, 2015, Grandinetti levitated on Hollywood Hollywood Blvd. at Highland around 11:45 am, 15 feet up in the air for four hours. Cosmos Gaming: When you were levitating are you in your “zone” or are you communicating with people when you are high up in the air? Michael Grandinetti: You have to concentrate what you are doing because it is dangerous, it is very challenging. People are down their taking pictures, it is very exciting and I appreciate that so I want to speak with them, make eye contact with them, and talk to them. I do try to medium with them without taking the concentrate away from what I am continuing doing. CG: Do you perform street magic often? MG: I primarily travel around the country for work, and I do arenas and events, but I love close up magic. I love being able to walk up to someone and show them something. When I came down from levitating there was a really great crowd of people so excited that I was doing a little impromptu show of street magic for them and I loved it. I don’t get a chance to do that too often because we’re always taking our show around but when I get the chance to do it, I really enjoy it. CG: Growing up, did you just always do magic tricks for your classmates, teachers, family and such? MG: The first time I performed, it was kindergarten for show and tell, and I was a very shy kid and remember being very nervous. There was girl before me with the same magic trick and I remember thinking, “oh no they’re going to see the same trick” but the kids were happy, the teachers were smiling. It was something I wanted to keep doing it changed my life. I took magic everywhere I went. I took it to school and showed my teachers and classmates and then the community. The community was so supportive to me as well, they hired me to start doing shows around town, and it was everything from local neighbor events to company events. Looking back at it I was a 12-year-old kid with a cardboard box of magic and I worked very hard. Companies that hired me did not treat me like a kid they treated me like a professional magician and that really had an effect on me and pushed me ahead. CG: What is the difference between an illusion and magic? MG: I think the key is that when you hear the word illusion it has a larger scale effect, making people float in the air, levitating above Hollywood boulevard, making a car disappear. When people hear magic they think of smaller things, close up magic, card tricks, using coins things that are close up to an audience. At the end of the day I am an illusionist and a magician, both parts creating the impossible. I think both are very similar but being the same thing, just one has a larger scale to it. 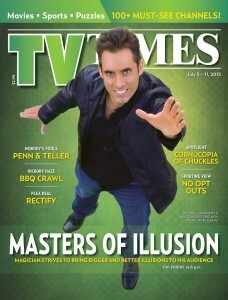 CG: In the show, Master Of Illusion the host asks, “Does the brain see what the eyes sees?” What is your take on that? MG: It’s interesting because thinking and studying magic for so long, for thirty years it’s hard to put on a switch and not watch a trick as a magician. I think a lot of people like a film director or a musician you’re watching your art form you’re analyzing. I wish I can turn it off and be amazed and love it but then I get to watch magic from the perspective of it being done. So even watching another magician you’re get amazed as well because you think “wow that’s a creative idea”. That’s the fun thing about Master Of Illusion there are magicians from all over the world, so you can watch that show in a half an hour and see eight, nine, and ten magicians, different illusions, it’s such a wide variety of magic. CG: Two of your illusions really stuck out to me and it was the, “Shrinking Girl Illusion” & the “Rings of Fire Illusion” can we expect something like that or different on this upcoming season? MG: We came up with six different illusions for the show, and what we wanted to do was not to make it bigger and better in relations of what we did last year but we wanted to make different towards mass television in general. We took a basic premise, we took a girl and floated her in the air, and when we filmed it. I invited the audience to come up on stage and surround me so the audience is around me while the girl is floating. We gave everyone super bright LSD flashlights to wave up and below, around the girl while she’s floating. If there were any strings or wires as people think some times that way the audience would see there isn’t. Another thing we did was having the camera all around and in front of the girl while she floats. So when you see this you’re not just watching a magician perform you’re going to see an illusion like you never seen it before, and we did that for each of the illusions we filmed for the show. I think once the audience tunes in there not only going to see an illusion but they are going to see it differently presented by magic, on television which I’m really proud of. CG: What is the best advice you can give to someone who is interested in practicing or trying to learn magic? Is this someone you think anyone can do or do you think there is a gift behind it? MG: Well I think with magic is whether you want to do it as a profession or you just want to do it as a hobby, I think there is magic for everyone. I think everybody, any age, any type of magic people should learn and have fun with it, show people and amaze people. Someone asked me the other day, “Is it to late for me to do magic?” and I said absolutely not. Anybody out there that wants to learn magic, by all means study the art, have fun with it, even if you don’t want to have it as a profession to be a magician. CG: With the, Don’t Blink series, now airing on POP TV, what is the best reaction you had from someone? MG: The one thing that’s so great about this show is that we were so close to everyone we could see their responses. I used objects borrowed from people; I would use their dollar bills, necklaces, watches, and their rings. And when you do something with someone’s personal item they tend to get really excited when they see it disappearing or reappearing or something magical to it. One of the greatest responses was when I had a girl draw on a sketch pad a little goldfish and I took the drawing and rubbed it and took it off the page and the goldfish became real, a real fish dropped into the glass, and her responses was wonderful. The whole show of people has good responses, and that is why I do what I do. I get to see people happy and amazed and I love that. CG: Do you believe in magic? MG: Absolutely! You know, I have never been asked that questions, so I absolutely believe in magic. I think there are things in everyday life that we still do not understand, and amazing consequences that cannot be explained. Both shows are something Grandinetti is very proud of, and hope families and friends come together and watch them and experience magic and illusions. The shows are fun, exciting, and entertaining. For anyone that has any questions for Grandinetti, he loves hearing from people you can reach out to him by social media, or check out his website and write in.